We’ve made it half way across South Dakota by the end of week 4, nearly 2000 miles, crossing the Missouri River into the Central time zone. The terrain change from Wyoming to South Dakota has been significant beginning with the Black Hills and the weather shifted to the mid-high 90s and beyond. It’s been another challenging week with one day holding 10 miles of gravel and another 30 miles of new chip seal. But that day also held Needles National Park and later in the week we were thrilled by Badlands National Park. One of the reasons we add this rest-day post is that it becomes a bit of a summary at the top each week’s posts when you click on any week at the top of the site. It’s the only post I share on Facebook. Today, I’m including photos from the week that didn’t make it in while sharing a few people stories. As you know only about 35 of us are doing the full cross-country tour (C2C), and we are the only tandem. Each week we lose and gain some folks. So it’s natural that we bond with those in it for the long haul. Some folks are only here for one week and we don’t really get to know them at all. And some are here for several weeks and we forget we’re going to have to say goodbye too soon. Each Friday night we do “awards”, silly little recognitions of folks and an opportunity to tell stories. This week 3 people who were leaving each received a plaque for completing the full C2C, in segments. Avi was here from Israel, Shereé from Louisiana. Shereé’s Dad rode C2C 3 times and started his 4th tour in his mid-80s! He was unable to complete it but this was an emotional completion for Shereé who’d been on his last tour. Two years ago Linda had planned to do the full C2C but broke a bone early on. Last year she did some segments with another company (C2C only happens on even years) and then completed the trip with us for 4 weeks. We picked up a new woman named Elle from the UK. She’s 21 and really hadn’t been a cyclist before joining the tour! She’s here for 4 weeks raising money and awareness about Anti-Slavery. She’s doing amazingly well. I think it helped when Johnny and Marina provided some essential info such as not wearing underwear under your shorts and using chamois cream. Johnny and Marina rode Cycle America’s Glacier Park tour last year and came back to do just this one week with us. Johnny is an ER RN from NJ. He’s very fast but often held back to be with Marina, a cycling friend engaged to someone else. Johnny generously lent me a pair of his Specialized BG Gel cycling gloves when I told him my hands were having issues from so much gripping. They were really great so I’ve ordered a pair to be delivered next week. Our youngest rider doing the full C2C is Scott who is 17. He’s doing it with his older brother Max. They’re from Vermont. This week we had Bob and his son Robbie join us. Robbie is just 15 and this is the second summer he’s chosen to ride a Cycle America tour. What a very cool thing Bob does, creating shared experiences with each of his kids. 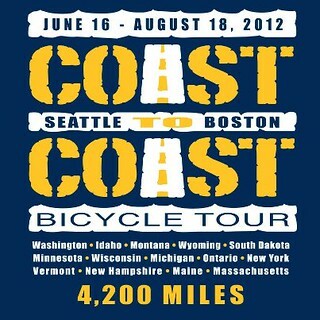 This leg of the trip also brought in a whole bunch of folks who’d done the full C2C two years ago. They came in just for a one week reunion, organized by Tom from the Netherlands. He rides a recumbent at home but bought an upright at a pawn shop in Rapid City, then sold it back to them when he was done! Turned out he is also vegan. One of the reunion riders was Dan who received a heart transplant prior to completing the C2C. He hadn’t been ill and suddenly caught a virus that went to his heart necessitating the new one. His “cause” is educating everyone to sign an organ donor card. We have done so. Have you? It’s such an easy thing to do to make such a huge difference. There is a real sense of community in sharing the literal and figurative ups and downs of doing this day in and day out. We offer each other help on the road when someone is stopped. We provide moral support when we’re feeling like we can’t go on. Most folks end up riding with others of their same pace. As the only tandem team there really is no one that we ride with consistently. There are a few who enjoy drafting off of us on the flats in a headwind (of which there have been many) and even on a fast downhill if they dare. But since we’re slower than most riding uphill these alliances do not endure. And while we do feel connected to many of our fellow tour-mates, I find myself slightly envious of the closeness the single riders are able to achieve when they find their match. Of course, we have found our match and make a fabulous team of two. And for that we are grateful. Neither of us would’ve chosen to do this any other way. Avidly following your posts about your amazing trip. I’m happy you are both staying well while traveling with the challenges the environment, colds and sore bodies throw at you.